The first antique toys I began collecting years ago were teddy bears, and although my toy collection has become much more varied since then, I am still always in perpetual bear hunt mode. 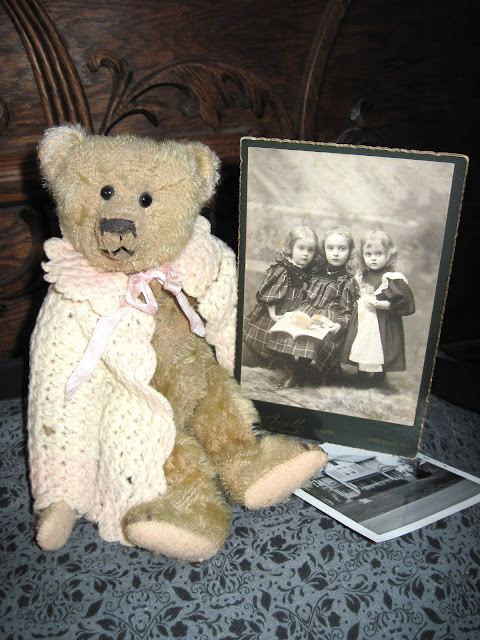 It's especially exciting to find an antique bear that comes with some provenance, like the photographs in this lot. The bear is an unusual 10 inch American made ted, circa 1906-1908, with a handmade sweater coat. 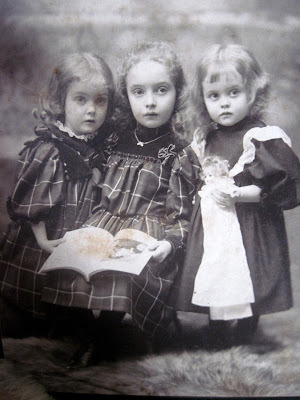 It came for Christmas along with a beautiful photograph of the little girls who originally owned it, and a picture of the house they all lived in, somewhere in Michigan long ago. These three little sisters were the bear's first owners. Although the bear isn't in this cabinet photo, a doll and picture book are prominently featured. 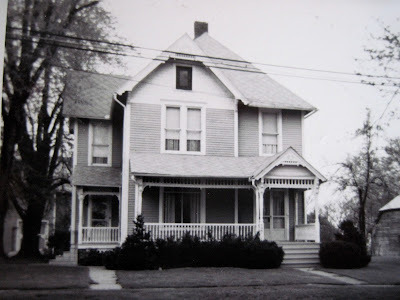 And here's the house where they all lived. Can't you just picture them playing together on the front porch? The teddy all on his own is wonderful but how amazing to have photos of his 'family' and his home as well!! Hi Norma! Have a great time at the cottage, and Happy Painting!